No matter in which climate zone you are, there is a wide selection of ferns that will grow in your area. Deciduous ferns such as the maidenhair, cinnamon and ostrich ferns are extremely hardy and can survive temperatures as low as -50 degrees. These ferns shed their leaves in fall and rest during the cold winter months. Evergreen ferns including the holly and shield ferns retain their foliage year round. Most tropical fern plants are everygreen and can be grown outdoors where temperatures do not fall below 20 degrees. A number of these also make excellent patio and container plants as well as good subjects for indoor growing. >Ferns are easy to grown and maintain and can be incorporated anywhere in your garden where you have a shady spot. They can be planted in formal rows for background or edging, or in groups as accents. Ferns also make wonderful underplanting for azaleas or other shade-loving shrubs and as a natural groundcover under trees in a woodland setting to create a tropical look. 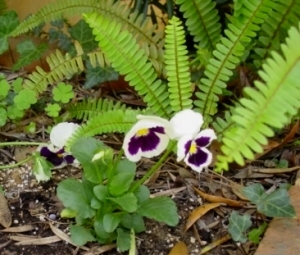 If you have a north-facing wall where not even weeds will thrive, enrich the soil and plant some ferns. Ferns are perennial and for the most part are slow growers. Once established, they will live for years. The most important thing to remember about ferns is that they all like soil rich in humus and plenty of water to induce humid conditions. A topdressing of compost in the spring is beneficial. Mulch will retain moisture and should be used where practical. Propagation is by spores, but it is not likely you will be successful in this method because proper care can not normally be met. Spore propagation of ferns requires very exacting temperatures and sterile conditions to induce germination and subsequent successful growth. Nevertheless, you can increase your fern plant collection by division or by digging up small plantlets which arise from spreading underground rhizomes.